Exit polls indicate today's elections may produce a paper-thin and fragile BYuT-NUNS majority coalition with 227 to 233 deputies in the 450 seat parliament. If Lytvyn's bloc, join them, this would increase to 252 - a reasonable working majority. PoR and Communists will probably only be able to muster 198 to 204 between them. If they are jointed by Lytvyn's bloc they will still only secure 223 places - insufficient to form a majority. But there are big buts..
PoR's sponsors will not readily accept their party going into opposition - they run too much of Ukraine's industrial base to allow their political enemies to control the country's economy. In their eyes Yushchenko's dismissal of parliament, and today's election, was illegal in any case. They were set fair for several more years in power until Yushchenko pulled the plug on the VR, so they will be hurting bad..
PoR will be desperate to form and lead a stable grand coalition with NUNS, and will demand the economic portfolios in any new cabinet. The wily fox Lytvyn will probably be working on a deal on these lines right now..
p.s. All pre-election opinion polls underrated BYuT 'big-time' yet again. Update: PoR's own exit poll has PoR at 36%, BYuT 30%, NSNU 11%, Commies 4.5%, with Lytvyn's bloc 'overcoming the 3% barrier'. Again it looks as if Lytvyn will be the king maker. I guess I go along with these figures - give or take 1-2%. By my calculations this would produce a VR with PoR having 195 deputies, Commies 24, BYuT 148 and NUNS 83, i.e. an orange majority of 12, but it is all just to close to call..
Lots more talking around Yushchenko's white round table to come then. Party of Regions does not exclude conducting extraordinary presidential elections, if representatives of "Regiony" do not enter the new government which may be formed after Sunday's parliamentary selections. "We presuppose what the results of elections will be, but the forecast result does not mean the forecast process. And on the basis that we cannot forecast how the political process will develop, we say that if today the will of the voters who support the Party of Regions, voters, who form the part of the territory of Ukraine that produces 2/3 of its gross [domestic] product, the will of these voters will not be taken into account, then it cannot be imagined that any future authority can be formed without the participation of Party of Regions." "If this political crisis which could spring up after the elections is not resolved by constitutional means, then a political situation could arise, where the solution to the same political crisis would be early elections, but this time early presidential elections." "This is the reality, and politician live with these realities, and no-one should be blamed for what will happen. There are objective laws, and there are different objective situations. If our political opponents understand this, even forecast this, then they also must be interested in working in the lawful field. To uphold the constitution, the law and the will of voter," concluded Bohatyryova. What she is saying in a clumsy way, is I guess, that even if PoR were to do badly in the elections they should be included in the new government because the regions of Ukraine where they have greatest support also produces most of the country's wealth - they are demanding control of the economic sector. Does she have a point? But PoR are going to win in any case aren't they? Right? The Corruption Perceptions Index for 2007 was published several days ago. The only cheering news for Ukrainians is that they beat the Ruskies [at 143] and their northern neigbour Belarus. Most of the "..stans" fared worse too..
A quick run-through of Ukrainian news sites starkly reveals the mess the country is in, which could endanger its democratic development. Suzanna Stanik, who had been relieved of her post as head of the Constitutional Court by presidential ukaz, and then reinstated by a regional court which recinded the president's ruling, is in 'hot water' again. The security services of Ukraine [SBU] has handed over evidence to state prosecutors indicating that she allegedly received a $12m bribe. Party of Regions have accused the president's secretariat and the SBU of jointly creating a mechanism for unprecedented falsification of the elections. At the same time, the SBU have opened criminal cases against officials in eastern Ukraine for falsifying elections lists. And lethal quantities of heophylline and digoxin have allegedly been found in the blood of the Minister of Internal Affairs Vasiliy Tsushko, who himself is responsible for law enforcement. The drugs may well have triggered his recent heart attack. Apparently this was confirmed by independent examinations, carried out in two German laboratories. Tsushko, at a press conference, reported that both examinations were completed on 21st September. He said that the blood sample, sent for analysis to Germany, was taken on 27th May. When asked by journalists, what where the motives for his alleged poisoning, he replied that it could have been either an attempt to provoke the beginning of a revolution, or the result of his anticorruption activities in the Ministry of Internal Affairs. He said that several days after the poisoning, head of the SBU Volodymyr Nalyvaychenko visited the clinic where he was being treated: "to see if had met his end or not". He continued: "In reply to who ordered it, [the poisoning], today the SBU is a structure, controlled by the secretariat of the President, and I think that V.Nalyvachenko was directed to me by the secretariat of the President, but I again repeat - I do not have any claims or suspicions against Nalyvaychenko". Tsushko said that the theophylline is used to treat asthma and chronic lung diseases of the lungs, but he had never taken such drugs. Digoxin is used to treat cardio-vascular disease. On 20th August, at a press conference in Dnipropetrovsk, Tsushko had denied that he had been poisoned, but on 1st June, Socialist VR deputy Yevhen Filindash stated at a VR session that Tsushko had been poisoned, and knew who the organizers of the poisoning were. On 26th May Tsushko was hospitalized with 'myocardial infarction". On 31st May, because of a deterioration in his condition, he was transferred to a German clinic and underwent a coronary bypass operation. What is fact and what is fantasy? - Ukrainian politics are rapidly becoming a farce. Marx said, "History repeats itself, first as tragedy, second as farce." Hopefully it will not be the otherway around. Today, in a TV interview, president Yushchenko expressed surprise that: "the head of executive government is flying around in a helicopter and at each meeting is telling everyone how falsifications are being prepared [in the elections]". "Why is it that Yanukovych is speaking about falsifications at each of his meetings? Because he has already planned this falsification. It will take place. We are talking about how to deal with problem," said Yushchenko. Half hour film on the Donetsk Mafia, in Ukrainian, by Volodymyr Ariev, here. It's well worth watching but takes quite a while to load, so be patient..
Would you put your money in a bank whose managing director spent three and a half years in prison for crimes of violence? Would you take your sick child to see a doctor who spent three and a half years in prison for crimes of violence? Would you trust a policeman who spent three and a half years in prison for crimes of violence? Would you let such a man teach your kids? Accusations and counter-accusations of cheating by the main political protagonists are reducing the chances of the September 30th VR elections being conducted fairly and producing a result that will be accepted by all participating parties - something that is being almost completely missed in articles on the elections in the Western press. E.g. Minister of Internal Affairs, Socialist Vasyl Tsushko today declared, "The police has uncovered 3.5 million immigrant workers who have long-left Ukraine [on lists], but have constantly voted for someone...of those 2.5 million 'dead souls' are from western oblasts and 1 million from southern ones..Many parties counted [them up] and wept, because for some it led to a loss of 5% of votes in the elections." According to the head the Ukrainian security services [SBU] department for fighting corruption and organized crime in the Kharkiv oblast, Andriy Mukhtayev, inaccuracies and errors in the lists of the voters of region are so widespread that they will be sufficient to distort the results of elections to 4.17%. 94,290 doubles have been discovered 'living' in the oblast, about 44 thousand of them in Kharkiv alone. Lugansk elector lists seem to show 435 voters at the age of 100 years still live in the city. The SBU have established that in Kharkiv, the lists of voters included more than 2,000 persons aged 107 or older. In Kyiv, where PoR have also accused the authorities of packing voter lists with 'dead souls' doubles etc.,the main political protagonists are already 'laying out their beach towels on the swimming pool loungers in the Maidan*'. PoR are setting up a big stage and large military-style tents in Independence square - BYuT are doing the same in St Sophia Square. *Mediterranean holiday resorts are frequented by holidaymakers from many European and other countries during the summer. Traditionally it is the Germans who get up the earliest in the morning, even before breakfast, to place their towels on the best-placed loungers around the swimming pool. LEvko thinks Ukraine's courts are going to be very busy after election day. Western media, e.g. Britain's 'Guardian' are overlooking the probability of a messy post-election period - political crisis is the default condition for Ukraine. Today in Sevastopol PM Viktor Yanukovych stated that any attempts to falsify the results of the extraordinary Sept 30th VR elections, or to declare the elections void, will result in large scale actions of protest. "We are receiving information from all regions of Ukraine that they [the opposition] have switched to a full program of utilization of administrative resources, and will try by any means to falsify the elections or ensure they do not take place. We know this. We have turned to the law-enforcement agencies, to the Procurator General's office, and to President Yushchenko. I said [to the President], if you go for this, you should know: for you it will end with you not only losing selections - some will not [even] have time to fly away from Ukraine, because all the common people will rise up. The country will rise up against these irresponsible people, who are destroying the entire country," said Yanukovych on Saturday, addressing a PoR meeting in Sevastopol, reportedly attended by 8000 supporters. Only a couple of days ago PoR announced it was their intention to withdraw from the early election campaign [and nullify the result?] if its opponents do not stop their alleged provocations. Does this sudden flip in strategy indicate the intervention of a hidden hand, or just confused leadership? More and more political commentators are predicting an untidy post-election period following to the September 30th VR elections. The new, 6th VR convocation, may not be able to function, but the present one, - the 5th convocation, which has held sessions even though it was 'dismissed', is considered illegitimate by half the country. As a result - the country could remain without a parliament, says Kravchuk. He added that in this case: "The President has the possibility to introduce direct presidential administration. He can turn to the people and say there is no parliament, it is necessary to formulate a budget and so forth. But if he does this, it will be the beginning of the end of the orange authority. When the President has only about 10% of the country's support, then to go this way is dangerous for Ukraine." More likely, if no clear winner emerges in the voting, a drawn-out battle in the courts will ensue. Also 'Ukrainska Pravda', in an article entitled "Arsenals of Yushchenko, Tymoshenko, and Yanukovych in the judicial war", describes who will be loyal to whom in the Central Election Commission, in the various courts, judicial councils, Prosecutor General's office etc., in the event of a judicial war taking place. The article concludes: "Of course any mechanism has flaws, however, at the end of the campaign, it is the Yushchenko-Tymoshenko team, and not Yanukovych's, which has demonstrated a systematic approach to their preparation for post-election [legal] battles." 2. hold an early parliamentary election on September 30, 2007..."
Also today Moroz told representatives of accredited diplomatic institutions that, "Yuliya Tymoshenko is paying 700 hryven each to members of polling station commissions in order to provide the 'required' result..and $1,000 per month to those who will agitate in territories for this political force." Part of a co-ordinated plan to scupper the election, or its results, if things don't go well for the anti-crisis coalition? And Vyacheslav Kyrylenko, the head of the political council of the NUNS bloc, is forecasting that parliamentary deputies elected from the Party of Regions' list of candidates will not recognize any new composition of the Cabinet of Ministers by refusing to attend next sessions of the new parliament. In the words of Irving Berlin: "There may be trouble ahead..
Serhiy Kivalov [see photo], former head of the Central Election Commission and 'fiddler in chief' during the 2004 presidential elections, now a PoR deputy, has written a piece in 'Glavred' entitled: "Will the results of elections [appear] by the winter?" He is the man whose face reminds me of the Sopranos, or Hollywood prison movies on the roof of Alcatraz. If he was ever in a court dock, he would get 6 months for looks alone. His literary skills seem to exceed the numeracy skills that he demonstrated in 2004. I've loosely translated some portions. "How many days will be required for the CEC to declare the results of the extraordinary elections to the Verkhovna Rada of Ukraine? Practical experience and [current] legislation suggest that the days required for calculation may turn into months. The 'oranges' declare, that the VR will be working already in October. Personally I have serious doubts doubts on this, and will explain why. The law of Ukraine: "On the election of peoples' deputies," states that the CEC must establish the results of elections not later, than 15 days after voting day, and results must be promulgated not later than 5 days after the day of the establishment of results. Everything would be simple, if it were not the high probability of the avalanche of complaints from outsiders of elective process. The code of judicial system administration has placed a time bomb on the periods of the declaration of the results of elections, because it forbids proclaiming the results of elections until the moment that not one complaint remains to be dealt with by the courts concerning the elective process. It goes without saying, each subject of the elective process and voter has a right to challenge decisions, actions or inactions of the election commissions at any level, if such decsions, actions or inactions omission disrupt their elective rights or interests. Any appeal has to be submitted within two days to an administrative law court. The period permitted to examine such matters is 5 days. The resolution of administrative law court can be appealed by an appellate order in the appellate administrative law court in the course of the next 2 days. The period the examination of such matters in the appellate administrative organs is 2 days. Thus, examination of a complaint by a voter could take up 11 days. Furthermore, an appeal on the work of neighborhood election commissions can be made up to 5 days after election day. The period of examination for such matters is 5 days. The resolution of administrative law court can be appealed in an appellate order to an appellate administrative law court during the next 2 days. The period of the examination of such matters in the appellate administrative court is 2 days. This means the declaration of the results could be postponed by two weeks. Finally the results can be can be appealed 5 days later in the highest administrative law court. The period of the examination of such matters in the highest administrative law court is 5 days. Consequently, matters could be dragged out for 25 days. Simple calculation shows the results of the extraordinary VR elections 2007 could be proclaimed 50 days after polling on 30th September. All this is not just manipulation of numbers, but the real state of affairs. But this only one side of the coin. On the other side, while all this being calculated, the work in the parliament will be considered illegitimate, and the country's problems multiply. E.g. the deadline for debating the 2008 budget in the VR has been postponed for an indetermined period, although according to the constitution of Ukraine and budgetary code the project must be directed by KabMin to parliament by 15th September, and should be is accepted in its entirety by 1st December. Deviation from this is a dangerous tendency. In the country the judicial system is being destabilized. Judges who have ended their five-year period of duty, and the candidatures of new ones which must be examined in VR for election to the post of judges, cannot take place. At the beginning of autumn of this year approximately 400 judges are not working, but are drawing a state salary, whilst the case-load of their remaining colleagues grows. I fear, that this time the popular saying won't ring true: we won't be able to count our chickens by the autumn. At best it will be winter already. And that, if the elections will not have been declared void." LEvko considers the scenario presented by 'Pidrakhuy' Kivalov to be realistic, particularly if the election result turns out 'even-stevens'. And as I have written previously, Yanukovych has called these elections illegal, so why should PoR accept the result if it goes against them? P.s. Several days ago a firearm was confiscated from Serhiy Kivalov while he was on board an aircraft that had taken off from Borispil Kyiv on an international flight. No charges have been made - the minister of internal affairs, Vasyl Tsushko, when questioned about about this, responded, "I know nothing, I'm on leave." Once again Ukrainian law enforcement officials have shown themselves, in the words of an old song, to 'have wooden legs, and their dogs to have rubber teeth'. In the small hours of 30th May this year, Serhiy Kalinovskiy, step-son of the infamous Dmitro Firtash [of RosUkrEnergo fame] and a member of Kyiv's 'gilded youth', smashed his convertible BMW M6 at high speed into a stationary Lada, killing his own 25 year old girlfriend and also the occupant of the Lada. On June 11th a farcical failed attempt was made to smuggle him out of the country from the clinic in which he was being treated for 'injuries incompatible with life'. More background details on this story from a previous blog here. In recent years there have been many cases of members of Ukraine's political elite killing innocent members of the public by driving recklessly. None of these cases have ever been properly dealt with or investigated. This Saturday Kalinovskiy 'dissappeared' from the swanky 'Biofarmtekh' clinic in Kyiv, where he has supposedly been treated for the last three and a half months, whilst on bail and under guard. He was apparently assisted by a group of accomplices, and having changed clothes, escaped through a rear entrance. He then climbed through a hole in the fence and was driven away in a waiting automobile. Much has been made of stripping criminal immunity from VR deputies recently, but everyone knows that in reality, if you've got enough money and the right connections you have it already - you are truly above the law. Is it any wonder Ukrainian law enforcement agencies and prosecutors are considered to be bad joke..
How important will be the 'fiddle factor' in the September 30th elections? Party of Regions have declared that in some parts of Ukraine, the oblast state administrations [ODA's] have distorted voter data in order to falsify VR election voting on September 30th. They say that according to the Ministry of Internal Affairs and state immigration service, in total, 3,323,000 Ukrainian citizens have left Ukraine in recent times, and have not returned. A large portion of these are from 'orange-supporting' western-most oblasts. 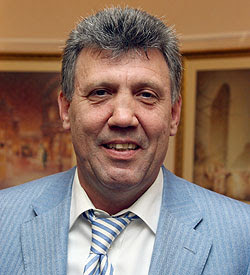 At the same time, according to the data provided by the chairman of L'viv ODA as a result of the updating the list of voters, as of 16th August, the number of voters in the region has increased by almost 20%, even though, according to Ministry of Internal Affairs data, as of 19th August, more than 524,000 inhabitants from the L'viv oblast who have the right to vote in the elections, have gone abroad. PoR say a similar situation allegedly exists in the Sumy region, which traditionally supports 'orange' politicians. There the number of voters has allegedly increased by more than 120,000. Most of the ODA heads may be considered to be pro-presidential in outlook. PoR are convinced that: "..differences in the voter list data provided by the heads of the ODA's and that provided by the Ministry of Internal Affairs, may indicate intentional distortion by local organs of authority of statistical data for the purpose of illegally obtaining a significant extra quantity ballot papers for further criminal use during voting." Meanwhile representatives of BYuT in the eastern Ukrainian city of Mariupol revealed that the list of the city's voters which has been sent to the Central Election Commission, contains a large number of people with the almost identical surnames, christian names, patronymics, addresses and even dates of birth. Senior BYuT leader Mykola Tomenko claims there could be 19,000 "pseudo-persons" on the list. If similar 'Mariupol-twins' scams are being prepared elsewhere, "then we can expect possible large-scale preparation for the falsification of electoral lists," warned Tomenko. BYuT is passing on all the documents to the CEC for thorough checking. LEvko thinks a significant number of politicians in Ukraine would be quite happy with a 'Florida scenario' and have the entire vote annulled, so expect see more fiddles* than in the New York Philharmonic at Carnegie hall in days to come. Some interesting, informative and well-reasoned speculation in the latest 'Kommentarii', in an article entitled: "Life after the elections"
"The snap parliamentary election campaign was undertaken not only for the sake of re-elections to the VR. The aim - at a maximum - was to create a dependable base for carrying out a referendum on the constitution , to tame regional councils, and to ensure a presidential election victory for Viktor Yushchenko, providing him with a second term in office. At first sight it would appear that for the President's Secretariat, the early elections are a matter of 'sh*t or bust'. The chances of a victory for either the ruling coalition or the opposition are identical - within statistical error. As in 2004 and in 2006, neither "white-blue", nor "orange" will have a significant majority. However the presidential team is playing another game in which even defeat in parliamentary elections is only a lost fight - hardly an argument for capitulation. The only alternative for which they are not ready on 'Bank Street' [pres. secretariat] is the highly improbable uniting of efforts of Yulia Tymoshenko and Viktor Yanukovych. The authorship of idea of parliamentary re-elections of parliament belongs to BYuT. Even if it will be possible to create a pro-presidential 'coalition of democratic forces' in the new parliament, and even if BYuT has the 'controlling share', this will not mean automatic nomination of Tymoshenko as prime minister. Yushchenko will demand certain guarantees: first, that BYuT unconditionally supports the president's initiatives, particularly the presidents proposal in any referendum on the constitution, and secondly, that Tymoshenko supports Yushchenko in the 20009 presidential elections. There is a considerable risk that Yushchenko and Tymoshenko will disagree, not only on the distribution of powers, but also about a program of actions to be conducted after the elections, including re-election of local councils and mayor of Kiev, and Ukraine's possible application to join NATO, etc. There is a substantial possibility of almost immediate infringement of agreements made between the two parties also. At the moment NUNS and BYuT are speaking about two different referendums: NUNS about the new Constitution, and BYuT about a choice between parliamentary and presidential forms of state administration. Both parties understand that the realizing of BYuT's proposal is fraught with problems for Yushchenko, whereas for Tymoshenko, whatever the outcome of a plebiscite, she will be in advantageous position. Formation of a common position by the two political forces has been postponed until after the elections. The greatest stimulus to unity between NUNS and BYuT is that if they once again show an inability to reach concensus, they, and their leaders, will lose electoral support. The main players in the elections are now seriously considering extreme possibilities. For example, no-one can now give a guarantee, that the new parliament will safely come to power. The problem is not with legal proceedings, though these could be drawn out, rather with expected decisions to recount votes in different areas - claims are being prepare already now. The greatest risk faced is that in certain constituencies the results of elections could be annulled. In this case there will be a questions raised on the legitimacy of the new parliament, as the will of inhabitants of some areas will appear to have been ignored. Particularly acute problems may be expected if the destiny of any party achieving around 3% of votes cast [the minimum threshold required to enter parliament] is in question, or if the two opposing coalitions receive approximately identical number of mandates. In the event that the 'blue and whites' lose, PoR and its possible satellites will insist that the previously elected VR remains the most legitimate. The extraordinary September 4th session of the VR, which the ruling coalition considers legitimate, but the President and opposition do not, supports this possible turn of events. If the post-election situation becomes aggravated or, not less probable, if the president's team wishes to aggravate it, there remains the possibility that the presidential team will not permit the new parliament to function at all. And, as the Constitution demands the government lays down its powers before the newly elected VR, the Cabinet too will appear illegitimate. In this case the President could nominate temporarily-acting members of the government — and could announce a referendum, declaring it a panacea to permanent political crisis. The big risk is that the country could 'wind up' with two parliaments and two governments, and the legitimacy of both would be extremely doubtful. The country would be only one step away from splitting - it would be necessary only to divide up the 'power' organs: who submits to whom. But if all parties were to agree to leave the final say with the people, a referendum, most likely, would not be limited. It could include re-election of all authorities in conformity with a new Constitution, including the Supreme Rada and the President. Hopes are not too high on the creation of a broad coalition. Previous attempts caused 'Our Ukraine' to lose significant support from its voters for a whole year. It is more probable, that in co-ordination with leading PoR 'shareholders, a "neutral" prime-minister, not formally connected with any political force, could be nominated. The PM's main task would be the formation of a "technocratic" government exclusively engaged on economic matters, as well as conducting a referendum. A pivotal role in this could be played by the Litvin Block, if it enters parliament. This government could include the best-equipped professionals, irrespective of their previous political history. The head of such a government could even eventually become a realistic contender for the president's chair. Sadly, the more effective such a technical prime-minister proves to be, the shorter his period of office could turn out. Such are the laws of competition. There are few people, apart from Tymoshenko's biggest enemies in NUNS and PoR, who have any faith in prospects of the new union between Yushchenko and Yanukovych. At stake are not only the post of prime-minister, but also the destiny of a referendum, and the entire political future of Yushchenko. The President should hold on to either Tymoshenko or Yanukovych. Otherwise both of them will contenders in the presidential elections - and Viktor Andreevich may not even make it into the second round." As usual, the onset of early elections in Ukraine has elicited some quick footwork by Ukraine's major business players to gain further assets, or to protect their own existing interests. I've posted recently on the 'bargain-basement' acquisition of a big slice of energy generator 'Dniproenergo', by companies associated with Rinat Akhmetov, gaving Yuliya Tymoshenko a weapon with which to 'hand-bag' PoR. PoR have been forced to respond via an official statement to Tymoshenko's assault, and there are rumours that a counter-attack is being prepared which will reveal that companies close to Tymoshenko herself had caused the decline of Dniproenergo. Today 'Ukrainska Pravda' even suggests there are reasonable grounds to assume that officials in Yushchenko's secretariat tacitly approved the deal, which now gives Akhmetov a dominant stake in the Ukrainian power generation market. And today 'Kommersant-Ukraina' runs a story [repeated elsewhere in Ukrainian] which reveals how two other of Ukraine's richest oligarchs, Viktor Pinchuk and Ihor Kolomoysky, have pulled off a clever stunt to reduce the odds of another huge industrial enterprise, the Nikopol Ferroalloy Plant [NZF], ever being reprivatized. I have in the past posted detailed background on the saga of NZF, which Tymoshenko had tried to reprivatize in 2005. Its owners, Pinchuk and Kolomoysky, had been rivals, but recently joined forces to prevent any possible reprivatization. They are now both regarded as generally 'pro-Yushchenko'. "Viktor Pinchuk and Ihor Kolomoysky [act to] protect NZF shares from [possible] reprivatization - as a result of Pinchuk's efforts, the block of shares in NZF, which could be returned to state, is now less than 10%. Yesterday the shareholders of NZF decided to increase the company statutory fund by more than five times. In the opinion of lawyers, the shareholders of NZF want to secure their business from possible attempts to reprivatize it after the parliamentary elections. NZF accounts for about 10% of world market for ferro alloys. In 2006 the enterprise produced 628 thousand tons of silicomanganese, 260,6 thousand tons of ferromanganese and 4,3 thousand tons of other ferro alloys. Profits in 2006 - 1,152 million hryven [over $200m]. 73% of the shares are owned by a consortium which is a part of Pinchuk's "Interpipe", 26% belong to the structures of Ihor Kolomoysky's "Privat" group. LEvko thinks maybe these guys are getting a bit worried how things pan out after September 30th. Akhmetov and Pinchuk, who had owned Kryvorizhstal before Yulka resold it, do not want to take another beating from that woman. p.s. More background information, on how NFZ's 'owners' planned to water down any majority stake in the company that could possibly be returned to the state, can be read in 'Kyiv Post' here, in an April 25th 2007 piece on shady privatizations. "I've looked at the sociology [statistics], which there is now on Ukraine. I looked the south-eastern regions: 50%-55%, up to 60% intend to go to the elections. If this indeed will be the turn-out, then this will be the result, it won't be necessary to blame anyone. These elections are now the question: "To be or not to be? ", and if the Ukrainian people want to have an orange government in power, it means, then this is what we'll get, if this will be the turn-out. If it does not want this - it is necessary for everybody to get out and vote. September 30th - go to the elections - this is main question for the country and the Ukrainian people." "If people say to us that we do not deserve their confidence, we will move aside, and as they say, we will carry out the will of the people," he added. As LEvko posted on 1st Ausust: "A straw poll on the [big-selling] 'Donbass' [newspaper] site, which asks visitors whether they will cast a vote on September 30th or not, currently has 54% replying 'Yes', and 38% replying 'No'. Not scientific, but worrying nevertheless for PoR. Voter apathy may be their biggest problem." According to a recent OP, the matters that most concern Ukrainians are: Increases in prices - 69%, Corruption, particularly in the higher echelons of authority - 50%, and unjustified housing and communal services tariffs - 48%. Other matters of concern were: Indifference of authority to the opinion of simple citizens - 42%, Inaccessibility and the low quality of medical services - 29%, Increasing drug addiction and alcoholism - 27%, Lack of welfare provision for pensioners, the poor, and for large families – 26%, The unsatisfactory ecological situation - 19%, Displacement of the Russian language and culture - 17%, Weak position of Ukrainian language and culture - 12%, and unfavorable conditions for the development of businesses - 8%. 3600 respondents took part in the poll. Who will be held responsible for unjustified price and housing charge price increases? Which political force will be considered most competent to fight corruption? Oh, and Donetsk mayor Aleksandr Lukyanchenko says bread and bakery product prices [a touchy subject in Ukraine] could increase by 20% by the end of the year. "Global reserves are at their lowest for 20 years," he explained. Will result of 'illegal' elections count? At a press briefing today, Viktor Yanukovych stated: "We quite openly said, that in order to preserve peace in Ukraine, we will go to elections which are illegal, and for the calling of which, there were no grounds....we said that those policians who want to receive an answer from the Ukrainian people, they will receive it." BYuT leader, Yuliya Tymoshenko, has declared that she is not Yushchenko, and so Yanukovych and Rinat Akhmetov, PoR's principal sponsor, will receive no amnesties, and assets deemed to have been gained illegally by means of shadowy privatisations will be returned to the state. In a recent TV interview, she calls the recent shady purchase of a major stake in 'Dniproenergo' by Akhmetov's DTEK company "a second Kryvorizhstal in magnitude". Will PoR be prepared to go into opposition as a result of elections its leadership consider illegal, if results are not it their favour? Will PoR be prepared to form a coalition with the party of a president who dismissed parliament and forced these 'illegal' elections, and who today, when being interviewed by western journalists, described last year's compromise deal with Yanukovych, giving Yanuk the PM's job, "..a big mistake. I was naive."? "Putin on a destroyer, Bush on an aircraft carrier, even Lukashenko on a tank. But our president - on a shovel". Former Internal affairs minister and NUNS leader Yuriy Lutsenko's response, on Shufrich: "[he] is incapable to running anything. He can't even catch the two crocodiles that ran away from the Kyiv and Mariupol zoos." When asked by journalists if he saw Nestor Shufrich as a possible successor to the post of minister minister of Internal Affairs, he replied: "Write this: in the time of the anti-national administration of Yanukovych, the number of crocodiles that ran away from zoos increased by 200%." Yesterday the Verkhovna Rada reconvened, despite three [or was it four?] presidential decrees to dissolve it. PoR are now less confident of victory in the September 30th elections because their ratings are falling. The motives of the Socialists to attend the VR sitting is clear - they, more than likely, will be wiped out in the elections so are desperate to hang on as long as possible. The Communists have limited access to Ukrainian media, so the VR provides them with a good platform for presenting their political program, and for free publicity. With "Regiony" the situation is more interesting. In August VR speaker San Sanych [Oleksandr Oleksandrovych Moroz] attempted to call an extraordinary VR sitting, but was not supported by his PoR allies. They had made an agreement with the president not to do so, and at that time were confident of victory on 30th September. This has now changed. Participation in the current VR sessions could provide 'insurance' in the event of an unfavorable result in the elections. As Oleksandr Moroz clearly explained in his opening address yesterday, if the sixth [i.e. the next] convocation is for any reason, not legitimate, then the current convocation will remain in place. Viktor Yanukovych is attempting to shore up support for PoR by acting as the 'voice of authority'. He has travelling up and down the country, ostensibly as PM, but in reality has been campaigning as head of PoR. Wherever he has turned up with 'a working visit', a public meeting has taken place - contrary to the law. Whether his meetings have gained any support for PoR is debatable. Koshkina considers that if their stay in power starts to appear questionable, 'Regiony' will undoubtedly do everything to 'scupper' the result of the election. An analogous scenario is being planned by BYuT with NU-NS in order not to remain in opposition. Three weeks remain before polling day - sufficent time to radically alter the course of respective campaigning. "In the event that the authority of the new parliament does not come about, then the parliament elected on 26th March 2006 will [continue] to act in full accordance to the Basic Laws [of Ukraine]. And the guarantee for this will be today's [4th September] sitting, as well as others, including pleniary forms of work." VR - is it a comedy, a circus? A laboratory, or battlefield with windmills? "It is my duty to address you in response to an attempt by the parliamentary coalition to aggravate the situation in our country. They are going to convene an illegal session of the Verkhovna Rada of Ukraine tomorrow, on 4 September.... I cannot watch this comedy in silence....esteemed deputies, calm down, do not abuse the people’s patience, do not make the Verkhovna Rada a circus, a laughing-stock. The life of the country is in the walls of the Ukrainian parliament but parliament is not a laboratory for your experiments and not a battlefield for tilting at windmills." President Yushchenko's TV address last night. You don't get much for $1m these days..
"How Putin failed to get a grip on political angle"
In March 2006 VR elections, BYuT obtained 11.89% of votes cast in the southern Mykolayiv oblast. 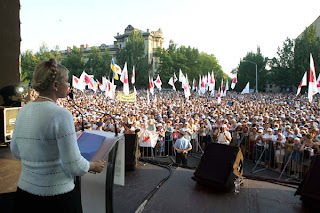 And today BYuT claim nearly 100,000 people attended their campaign rally in Kyiv's Independence Square, which was addressed by Tymoshenko ..
With four weeks to go before the elections, observers claim, "undoubtedly, the start of the election campaign has been won by BYuT..[who are] conducting the most powerful campaign..[nevertheless] the leader of the campaign is PoR, even though their ratings are not growing." "The biggest disappointment in August is NU-NS's election campaign."